Today, Lead Investigator of the Programme for Improving Mental health care (PRIME), Prof Crick Lund, presents key recommendations for setting up, costing and evaluating mental health care plans in low- and middle-income countries, to delegates attending the World Bank and International Monetary Fund Spring Meeting. PRIME was selected out of a long list of mental health programmes worldwide to present at this inaugural event. 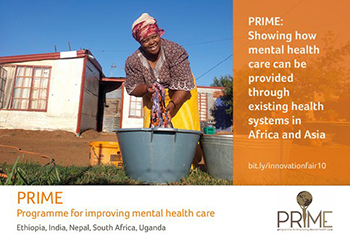 The goal of PRIME is to generate evidence on the implementation and scaling up of treatment programmes for priority mental conditions in primary and maternal health care contexts in low-resource settings. It’s currently conducting research in South Africa, India, Nepal, Ethiopia and Uganda. PRIME research determined that implementing mental health care plans are extremely cost-efficient. To make budgetary provision for mental health care, the PRIME team calculated the cost of implementing mental health care plans over a 5- to 15-year scale-up period. It ranges from US$ 0.20-0.60 per capita in India, Nepal, Uganda and Ethiopia and was close to US$ 2 per capita in South Africa, an upper-middle income country. The unmet need for mental health care is high in most low- and middle-income countries. The consequences of untreated mental disorders include suffering, diminished quality of life and disability, human rights abuses, stigma and discrimination, poverty, poor physical health and premature mortality. The next stage of PRIME research will include evaluation of the implementation of the mental health care plans as well as further research on scaling up the programme.